We wondered around the city all day Saturday and most of Sunday. 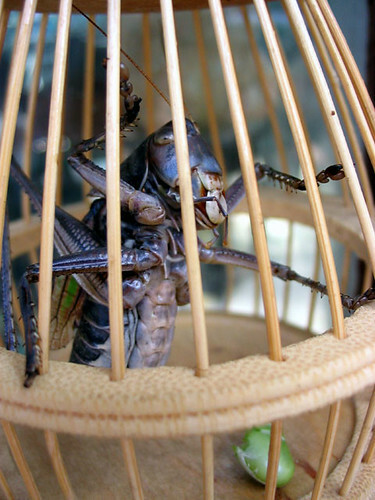 The plant, animal and insect market provided lots of photo opportunities. Here are a couple of examples, see www.flickr.com/photos/stewsnews for more. I’ve had a few requests for photos and more info about my classes. I’ll try to put together something soon. In the mean time please drop me an email! 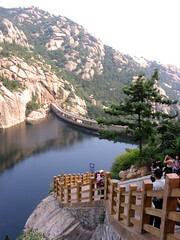 Last Saturday I ventured to Lao Shan Park. What I thought would be a short trip turned into a major excursion. After an hour bus ride I arrived at the main gate, jumped off and started into the park along a beautiful beach. It turns out I was more than 10km from the true entrance. As I hiked along the narrow road into the seaside hills I admired the scenery less and became more concerned with oncoming traffic. Eventually I flagged down another bus and rode to the main “hiking” area. The trails will all paved steps, too numerous to count. I huffed and puffed my way up but gave up before reaching the top. Still it was nice to get out of the city for a bit, and now that I have been once I know what to expect next time. 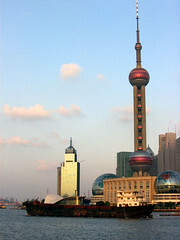 This weekend I am going to Shanghai in order to meet up with some friends. Although I have only been in Qingdao for 3 weeks, I am looking forward to getting out for a couple of days. As part of the process to get my residence permit I needed to go through a medical check. While I was full of anxiety about this, the entire procedure took a little over an hour and was mostly painless. In addition to filling out forms with my height, weight, and blood type, I had my blood pressure taken, an electrocardiogram, an ultrasound of my liver, blood drawn, and a chest x-ray. They haven’t kicked me out of the country yet so I guess everything checked out. The clinic was set up to provide the medical checks for visiting foreigners and was very clean and efficient. 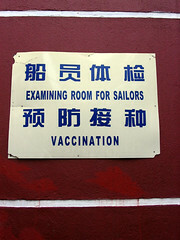 While there I noticed a special section with a large sign: “Examining room for sailors. Vaccinations,” I guess the sea can truly be a harsh mistress. As most of you know the site has been down for the past week. I’ll spare you the technical details and just say I am still adjusting to life without a regular connection to the internet. Hopefully I’ll have something worked out in the coming weeks. I have been waist deep in teaching since Monday. The first days of any new term are always a challenge but these last few days have been particularly difficult. My fellow foreign teacher, Annie from Canada, and I are still without textbooks or an office. Our living situation continues to improve but getting things done in a timely manner has proven tricky. 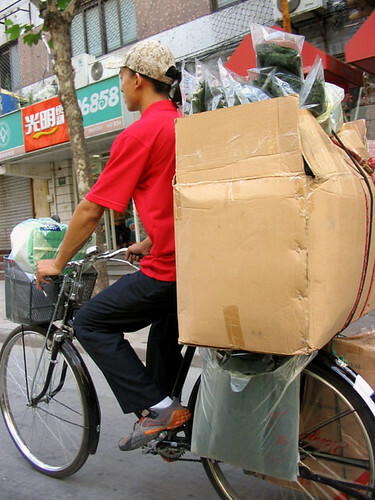 Such is life in China. Three hours a day I teach seniors preparing to study in English speaking universities. We are slowly warming up to each other and while we have lots of work ahead, I am optimistic. I also teach a classroom full of sophomores for an hour in the evenings. I foresee a great many challenges dealing with their multiple attitudes, abilities, and personalities. Should be interesting. The school’s English department has been extremely welcoming and friendly. On Saturday there was an awards ceremony and series of performances by various departments in honor of “Teacher’s Day.” It was followed by a huge meal at a nearby hotel. Both the food and company were superb. 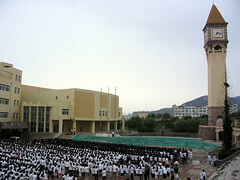 Monday was the first day for most of the students at Qingdao No. 2 Middle School. 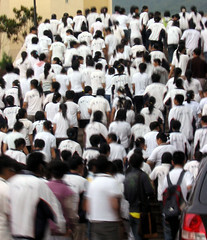 (China midddle school= US high school). Like returning students everywhere folks were excited and more than a little nervous, myself included! Luckily I don’t start teaching until next week. I’ll try an fill you in on details about the school and my living accomodations in the coming days. In the meantime there are more photos at my Flickr page: http://www.flickr.com/photos/stewsnews/. 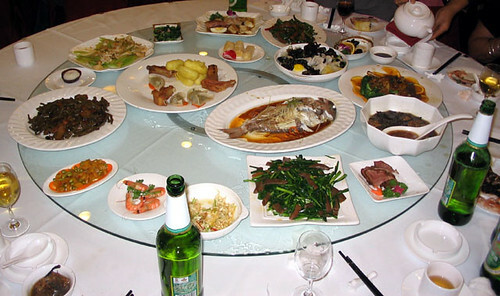 Just a short note to let everyone know I have arrived in Qingdao. Although today was the first day of school for the students， I do not start until next week. The school administrators figure I need at least that long to re-adjust to living in China.